How do you currently store your jewelry? In a drawer? In a jewelry box? In several? The problem is- when you don't have an organized way to store your jewelry- you tend to wear the same pieces over and over because you forget what you own! And whether your collection is mainly costume jewelry or made up of the “real deal”- your jewelry was an investment. So you want to take great care of it- and use it! 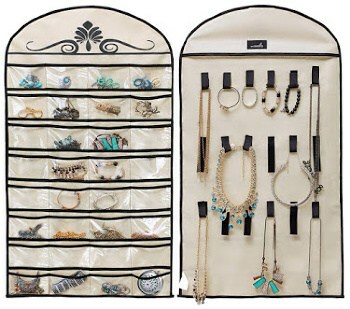 Here's how to get organized with the best jewelry organizers! Glenor Jewelry Box This is an affiliate link: MomOf6 earns a commission if you purchase, at no additional cost to you. 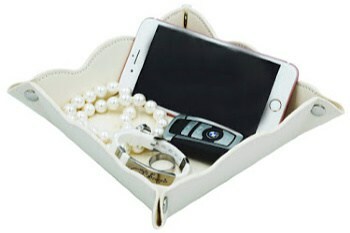 Top Pick for Jewelry Trays: Leather Valet Tray This is an affiliate link: MomOf6 earns a commission if you purchase, at no additional cost to you. Top Tabletop Pick: Kankei White Metal & Wood Jewelry Tree This is an affiliate link: MomOf6 earns a commission if you purchase, at no additional cost to you. 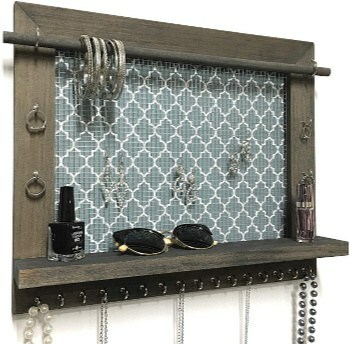 Longstem Over the Door Jewelry Organizer This is an affiliate link: MomOf6 earns a commission if you purchase, at no additional cost to you. SongmIcs Jewelry Armoire This is an affiliate link: MomOf6 earns a commission if you purchase, at no additional cost to you. 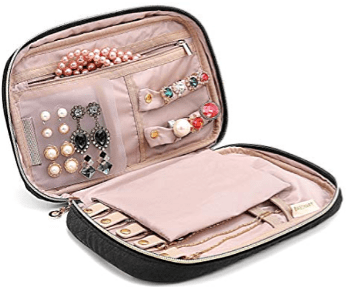 Lily & Drew Travel Jewelry Organizer This is an affiliate link: MomOf6 earns a commission if you purchase, at no additional cost to you. 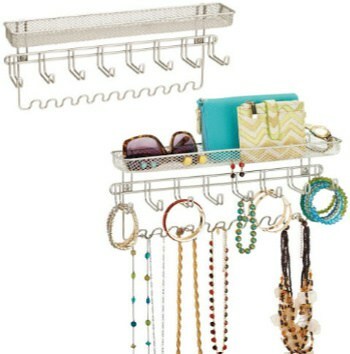 What Type of Jewelry Organizer Do You Need? How large is your jewelry collection? Before investing in anything- it helps to take an inventory of what you have. So clear some space on the dining room table or the top of your bed, and start bringing out all of the jewelry pieces from all of your current storage spots. As you go through your items, sort them by category- necklaces, bracelets, bangles, earrings (post and dangling), rings, and watches, and count up the number of pieces that you own of each category. This is an excellent opportunity to do a little curating of your collection as well- removing items that you no longer love or wear. Set those aside to donate to a family member or friend. This process will give you a starting point to make sure that you purchase something large enough to hold your entire collection. And be sure to scale up just a bit so you have room to purchase a few new pieces in time as well! Where would you like to store your jewelry? Do you have room to hang an armoire on the wall? Would you prefer to hang an organizer on the back of a door or in a closet? Or store your jewelry on a nightstand, dresser or vanity top? Would you also like a place to hold jewelry pieces that you wear every day- such as on a tray next to the bed? How would you like to store your jewelry pieces when you travel? The answers to all of these questions should shape your purchasing decision! What Features Should You Look for in a Jewelry Organizer? If you want to keep those little people in your home out of your jewelry box- you'll want to buy one that locks! For smaller-sized collections or to separate a larger collection into wearable categories (daytime jewelry, costume jewelry, glam jewelry, etc.) a tabletop jewelry box is a great solution. Be sure to compare the size of the jewelry box to the size of the space where you would like to house it- to make sure that it fits! 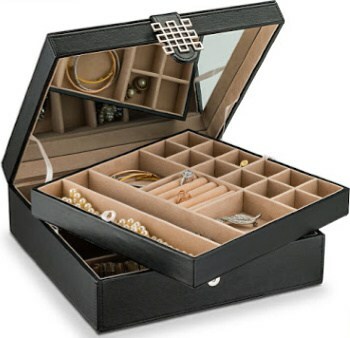 Top Pick for Jewelry Box: Glenor Jewelry Box You will love this soft leather-like feel of the outside of this jewelry box, with its beautiful contrast stitching, and the compartments are lined in an elegant velvet. With a removable top tray over the multi-compartment bottom tray- it offers a surprising amount of storage in exchange for taking up such a small footprint on your dresser! Kendal Huge Leather Jewelry Box Available in black, brown, and white leather- this jewelry box holds a lot of jewelry pieces in a small space! Lined in suede, the 5 drawers and 2 swing-out cabinets offer plenty of room for all of your pieces. Includes a beveled glass mirror in the lid. It is not a lockable box, but you can add a lock on your own. 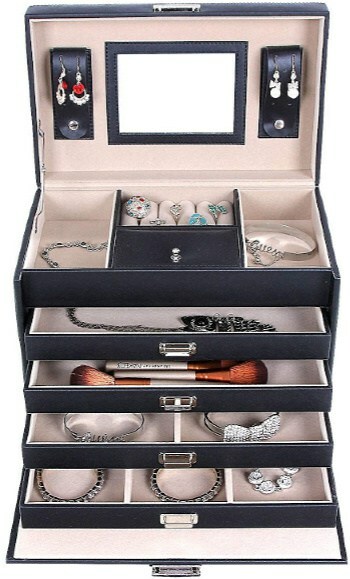 Songmics Lockable Jewelry Box This lockable 5-drawer jewelry box is constructed of faux leather (which is perfect for dusting and wiping down) and lined in velvet. 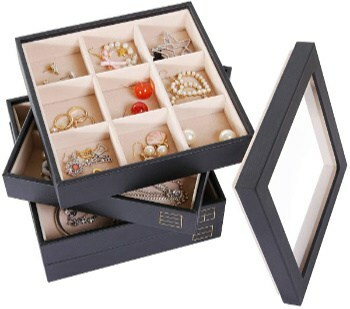 It has 5 removable drawers with multiple compartments, a small mirror in the lid, and space for longer earrings- it's a great jewelry box for the price! 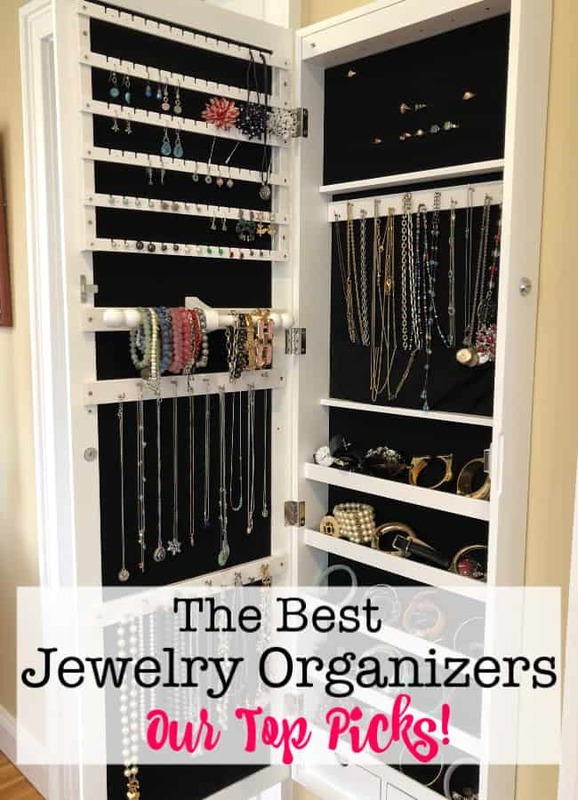 Personally- while I use a wall-mounted armoire to hold my jewelry collection- I also like to have a jewelry tray on my nightstand to hold the pieces that I wear every day. It keeps my night table organized, and prevents pieces from rolling off! Top Pick for Jewelry Trays: Leather Valet Tray This simple PU leather tray is perfect for a nightstand or dresser, and provides a drop-place for all of the day's jewelry. With fold-up sides and snaps. Fold-up and snap the sides to create a tray. Also folds flat for storage. Small size is not meant to hold your entire jewelry collection. PU leather can easily be dusted or wiped clean. 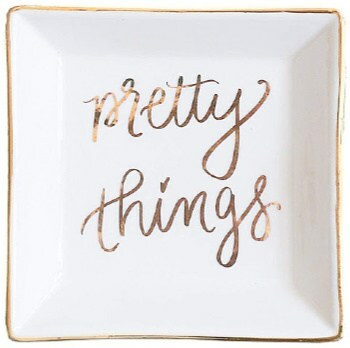 Pretty Things Jewelry Tray Ceramic hand-lettered jewelry tray with gold foil details. A perfect place to hold your "pretty things"! Valdler Clear Lid Jewelry Tray This set of 4 stackable trays can be used individually with the clear lid or stacked as a unit to hold your jewelry pieces. The lid will protect your items from dust while making it easy to see what is inside. The 18 compartments inside are lined in velvet. My teen daughters prefer to use a tabletop jewelry tower to hold their pieces- which is perfect for a smaller collection. The one downside is that you have to dust your jewelry regularly with this system. Top Tabletop Pick: Kankei White Metal & Wood Jewelry Tree This jewelry tree features three tiers constructed of white metal (iron with a white powder coating) attached to a natural wood base. Plenty of room to hang a dozen necklaces, bracelets and bangles, as well as dangling earrings. The top tier is adjustable and can be extended to hold long necklaces. Holds a lot of jewelry in a small amount of space! Metal Jewelry Tree The sleek contemporary design of this chrome tabletop jewelry tree will look great on a bedside table or on a bathroom vanity. The 3 tiers feature curved ends to keep the jewelry from sliding off of the arm. The large tray at the base can hold earrings and rings. 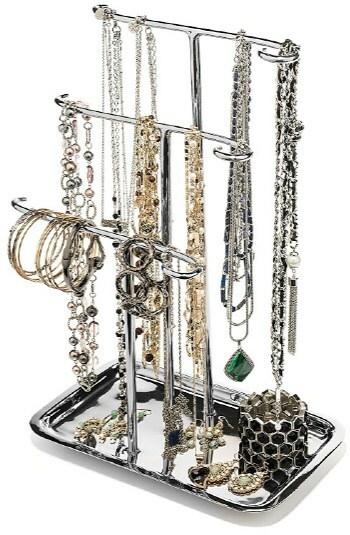 Modern Metal Jewelry Tree Available in a black or white finish- this 3-tier metal jewelry organizer features ball-capped bars for holding necklaces and bracelets. The large tray on the bottom can hold rings and earrings. If you are tight on space, a hanging jewelry organizer that can hang on the back of a door, or inside of a closet might be the perfect solution for you. Just be sure that you can easily access your collection (if you are storing it in your closet) and that you carefully open and close any doors holding a hanging organizer- so the necklaces don't become tangled! Longstem Over the Door Jewelry Organizer This steel-coated jewelry organizer can be hung over the back of a door using the provided low profile door hooks (which means your door will still close! ), or it can be wall mounted with the included hardware. 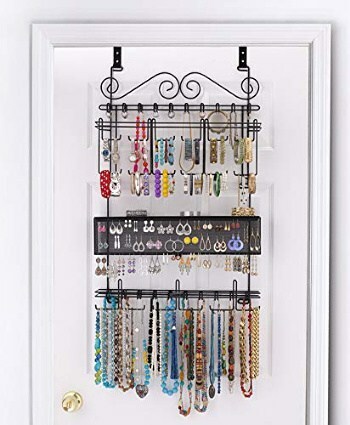 The beautiful design features 38 hooks as well as shelves so you display all of your jewelry in one place! Holds more than 300 pieces of Jewelry! Be careful when opening/closing the door- it can be" jangly" noisy! Misslo Hanging Jewelry Organizer This dual sided jewelry organizer uses an ordinary hanger slipped in at the top for mounting. It features 18 loop closures for hanging necklaces and bracelets and 32 clear pockets for holding smaller items such as rings and earrings. Also works great for holding hair accessories or nail polish! 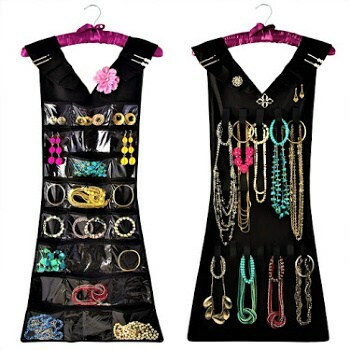 Marcus Mayfield Hanging Dress-Shaped Organizer This adorable dress-shaped dual-sided jewelry organizer hangs on its own pretty satin hanger and includes 17 hooks and 24 pockets to organize all of your jewelry. Can also be used for hair accessories, nail polish, or cosmetics! For larger jewelry collections, a wall mounted armoire is truly the best option! With a door to close, your jewelry will be protected from dust, moisture, and sunlight- and the armoire will just look like a beautiful full-length mirror on your wall. 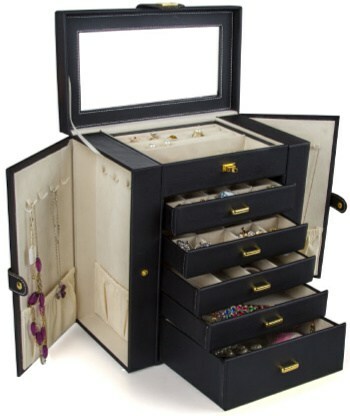 While it is a larger investment to purchase a system like this- your jewelry itself is an investment worth protecting! SongmIcs Jewelry Armoire This large jewelry armoire can be hung over a door or mounted on a wall with the included hardware. The front of the door holds a full-length mirror, and closes with a strong magnet and is lockable as well. The inside of the armoire features tons of hooks, bar, shelves, earring slots, and drawers to hold your entire jewelry collection! It can be difficult to hang stud earrings because it is hard to reach behind the frame. Jewelry hooks are hung above pockets so you can easily tuck in long chains. Full length glass mirror on the door allows you to check your look! 90 earring slots, 2 drawers, 5 shelves, 2 rods, and tons of hooks. Firwood Forest Wood Frame Organizer This beautiful solid wood frame jewelry organizer is made in the USA. 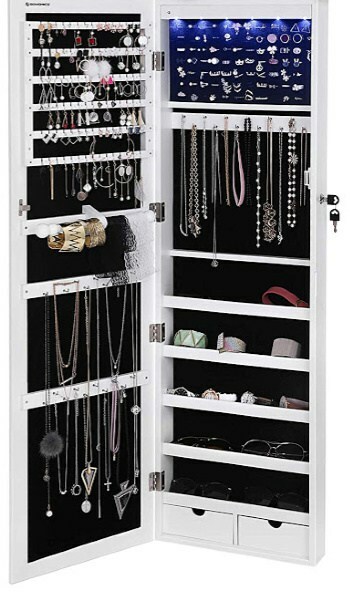 It features a mesh screen to hold earrings and 20 hooks to hold necklaces. A large bar runs across the top to hold bracelets and a shelf runs along the bottom to hold anything else! 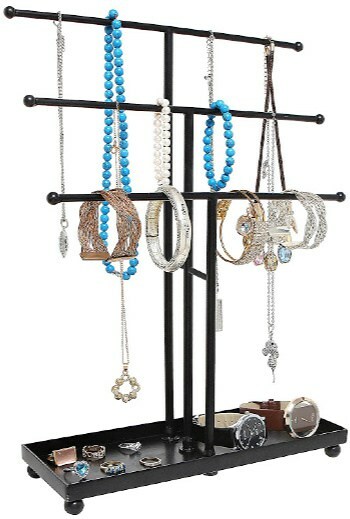 Set of 2 mDesign Metal Jewelry Organizers Made of solid steel wire with a durable rust-resistant finish, each of the two organizers features 8 large hooks and 11 small hooks to hang bracelets, necklaces, bracelets. The basket at the top provides additional storage for rings, earrings, and smaller pieces. A girl's gotta travel, right? Which means you need a great way to travel with your jewelry- using a system that keeps everything safe and secure- and make it easy to see what you brought along so you can wear it! Lily & Drew Travel Jewelry Organizer This is a beautiful jewelry organizer that allows you to carefully hang your longer pieces and clip them at the top with a snap. Bangles and other bracelets can be placed in the zip top case and then inside the main case. There is space for earrings and securely storing your rings as well. Velvet interior to protect your jewelry, and 2 interior zippered pockets to secure watches and bracelets. Bagsmart Travel Jewelry Case This fabric travel organizer comes in 3 colors. With 5 snaps at the top for hanging the necklaces and pockets below to hold them in place, and holes for 15 pairs of earrings. Padded ring loops and zipper pouches keep your jewelry accessories neatly organized while you're on-the-go. Teamoy Roomy Travel Jewelry Case This roomy travel case has a deep pocket that holds chunky necklaces, watches, and bracelets. The dividers in this bottom pocket can also be removed as needed. The clear zip up pocket gives you additional room to store more delicate items. Looking for More of Our Top Picks? I hope that you found this post to be very helpful as you consider your options. Please leave a comment if you have any questions!